In our times we have seen the important work of Pope John Paul II on the “theology of the body” misunderstood and applied in a superficial and, at times, morally problematic way. One example is a claim I once heard, namely, that the very bodies of spouses are causes of grace, such that when they come together in the marital act, and assuming no moral impediment such as contraception, an increase of sanctifying grace is bestowed on each or both spouses. This claim, as it stands, is false—although something like it is true. The only signs that effect or bring about the sanctifying grace they signify are the seven Sacraments of the New Law. In this sense, it is impossible that the spouse’s bodies, as such, should be causes of grace in a proper sense, such that when the cause (bodily action) is posited, the effect (increase of grace) follows. 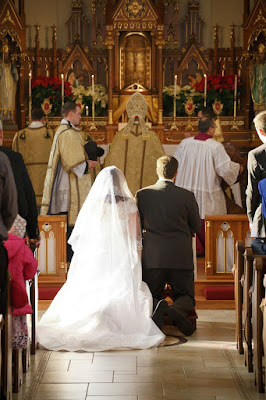 Rather, the bodily mutual self-giving, open to new life, is the outward sign of the Sacrament of Matrimony itself, which, present and operative in a mysterious way in the souls of the spouses, is the cause of an increase in sanctifying grace. Put more simply, the efficacious sign is not the bodily action but the sacramental union and state, which is represented and furthered by the bodily action. On the other hand, any bodily act done out of charity is a cause of grace in the sense of being a moral cause of meriting an increase of such grace. In this way, the nuptial act is like an act of almsgiving, or clothing the poor, or instructing the ignorant—all of these are acts of a will animated by charity, performed with the help of the body and meriting an increase of grace. The Pope chooses his words with care: the body is a “sign,” a sign of self-giving, a “place” and a “language,” but in and of itself it does not expressly signify sanctifying grace, nor directly confer it. This is what the Sacrament of Marriage or Matrimony is and does. If the spouse’s body were a cause of grace just by being what it is, namely, a sign of self-giving, it would follow that the body or the nuptial act is an eighth sacrament, a claim certainly contrary to the dogma of the Faith. I know a priest (he was married as an Anglican curate and was later ordained a Catholic priest) who refers to this kind of loose talk as “gamolatry,” that is, a sort of worship of things pertaining to marriage. Thus, even that which theologians have taken to calling the “primordial sacrament,” the very humanity of Christ, is effective among us in this world precisely through the seven Sacraments of the Church, and not somehow over and above and apart from them, as if it were an eighth sacrament that could be numbered alongside the other seven. The Church, too, may be called a “sacrament,” but in an analogous sense—for she, too, is built up from the seven sacraments, from which she derives her very existence and activity, as the Second Vatican Council teaches. The Eucharist, especially, is the root and the constant origin of the Church in this world. Without the Eucharistic Body, there would be no Mystical Body. This is why St. Thomas Aquinas teaches that the “reality” of the sacrament of the Eucharist is nothing other than the unity, or charity, of the Mystical Body itself (cf. Summa theologiae III, q. 61, a. 2). How beautiful it is that spouses receive in marriage a new participation in the love of God and the Passion of Christ, as well as a new power to participate in creation and redemption by begetting children and offering them to God in baptism! The quasi-character imprinted in their souls by the marriage vows remains throughout their life as a constant claim before God of all the graces each needs to fulfil the duties of his or her state in life; it is a permanent mark of their mutual surrender to and “ownership” of one another; it is a likeness of the relationship that unites Christ to His Bride, and the Church in turn to her Bridegroom, in an unbreakable union of eternal fecundity.